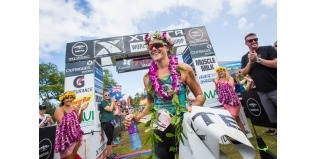 On a "wild, windy and muddy" day in Kapalua, Maui, Bermuda's Flora Duffy won her third consecutive XTERRA Off-Road Triathlon World Championship title on Sunday, to earn $20,000 from the total $100,000 prize purse. Scotland's Lesley Paterson, World Champion in 2011 and 2012, took the Silver with Suzie Snyder (USA) in third. Jacqui Slack secured another top-10 finish in Maui, with seventh. Duffy lead from the front, with the fastest splits across all three disciplines, but conditions ensured that it was not an easy victory. The 21-year old Mendez set the fastest run split of the day, which allowed him to overtake Ruben Ruzafa (ESP), the three-time champion in the final stages of the run to take the Gold. Jacqui Slack's partner, Ben Allen (AUS), took the Bronze medal - the third time he has achieved that result in recent years. Great Britain's Kark Shaw finished 14th.